When asked on Tuesday, BC Premier Clark did not directly answer the question of whether ICBC should have to release the projections, only saying she wants to ensure rates don’t go too high in the immediate future. Premier Christy Clark is avoiding the discussion on whether the public insurer should be required to disclose future projected rate increases. 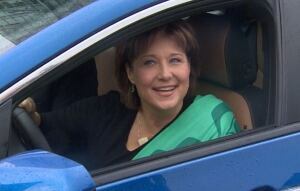 Premier Christy Clark wants to make sure ICBC does not increase rates more than 4.9 per cent this year. The provincial government has approved a 4.9 per cent increase in 2016 that would add $3.50 a month to the average auto insurance bill or $42 a year. The B.C. Utilities Commission, the organization that regulates ICBC, has called on the insurer to provide some clarity to what sort of increases are expected each year until 2020. ICBC has refused to this point to release the projections because of concerns they would be taken out of context. ICBC has already submitted an application that would see rates go up 4.9 per cent. NDP critic Adrian Dix says Clark is being disingenuous in her statement about making sure rates do not become unaffordable. Dix has calculated that ICBC insurance rates have gone up about 30 per cent over the last five years. Documents provided by Dix also show the provincial government has moved nearly $1.2 billion from ICBC revenues into provincial coffers. It is unclear where that money was used, but the province has committed to not taking revenues out of ICBC’s account this fiscal year. “It is time the public sees Christy Clark’s pure incompetence at ICBC. The gall for to come out and say she is protecting taxpayers when her government scooped out $1.2 billion that was suppose to be used to pay for claims,” said Dix. ICBC argued the 4.9 per cent increase is necessary in order to cover an increase in claims and incidents of insurance fraud. The BCUC still needs to approve the rate increase before it is finalized.